What are the main differences between 45' standard high cube container and 45’ pallet wide container? 45 feet containers are the replacements units of semi-trailers which are extensively used in land transportations. While some 45 feet containers have very similar internal dimensions of a standard trailer, some 45 feet containers have identical internal dimensions of a standard trailer. Today I would like to compare not only 45' standard high cube and 45’ pallet wide containers but also their internal dimensions with the standard semi-trailers. What are the specifications of a 45' standard high cube container? 45' standard high cube container is a general purpose freight container. It is not widely used in international sea freight comparing to other general purpose freight containers such as 20’ and 40’ containers. 45' standard high cube container is wholly enclosed so that the goods inside the container have no contact with the outer environment during the sea carriage. They have totally rigid roofs, rigid side walls, rigid end walls and a floor. At least one of theirs end walls equipped with doors allowing easy loading and unloading of the goods. Internal Dimensions: Internal length 13,556 millimeters, internal width 2,352 millimeters, internal height is 2,700 millimeters. The capacity of a 45' standard high cube container is 86.1 cbm. Max Payload: Maximum payload of a 45' standard high cube container is 27,450 kilograms. How many euro pallets you can fit in a 45' standard high cube container? You can fit maximum 27 pcs of EURO pallets in to a 45' standard high cube in single loading plan. On the below picture you can find how to fit maximum amount of euro pallets in a 45' standard high cube. 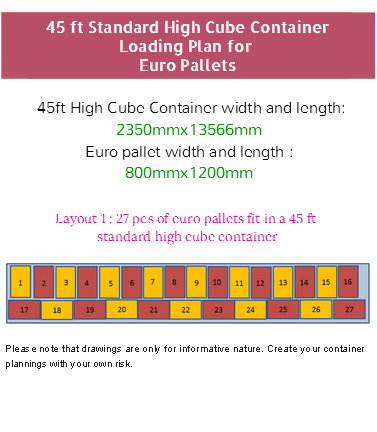 What are the specifications of a 45' pallet wide high cube container? 45' pallet wide high cube container is a general purpose freight container just like 45' standard high cube container with only one exception. 45' pallet wide high cube container is wider than 45' standard high cube container. Internal width of a 45' pallet wide high cube container is 2440millimeters, which is 88mm more than standard size container internal width. This extra space allows you to load two pallets side by side in a 45' pallet wide high cube container. Internal Dimensions: Internal length 13,556 millimeters, internal width 2,440 millimeters, internal height is 2,695 millimeters. The capacity of a 45' standard high cube container is 89.2 cbm. Max Payload: Maximum payload of a 45' standard high cube container is 29,720 kilograms. How many euro pallets you can fit in a 45' pallet wide high cube container? 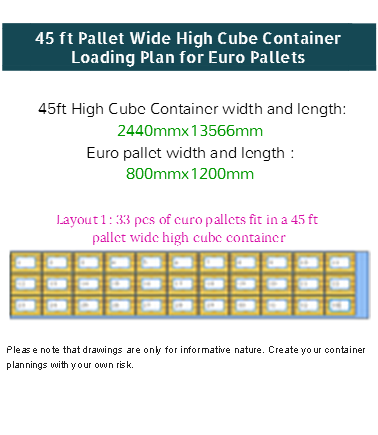 You can fit maximum 33 pcs of EURO pallets in to a 45' pallet wide high cube in single loading plan. On the below picture you can find how to fit maximum amount of euro pallets in a 45' standard high cube. Internal length of 45’ standard high cube, 45’ pallet wide high cube containers and curtainsider trailer are the same. Internal height of 45’ standard high cube, 45’ pallet wide high cube containers and curtainsider trailer are the same. Internal width of a 45’ pallet wide container and curtainsider trailer are the same. Internal width of a 45’ standard high cube container is less than 45’ pallet wide high cube container and curtainsider trailer. You can fit 33 euro pallets in a 45’ pallet wide high cube container and curtainsider trailer, whereas you can only fit 27 euro pallets in a 45’ standard high cube container. You can fit 26 standard pallets in a 45’ pallet wide high cube container and curtainsider trailer, whereas you can only fit 24 standard pallets in a 45’ standard high cube container. 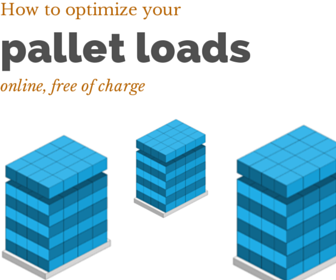 Maximum payload is exceeding allowed weight limits of carrying goods on land in most countries. As a result you can load not more than 23 or 24 mtons of goods in a 45’ container or curtainsider trailers. You should confirm with your forwarder the maximum gross weight of goods allowed under a particular shipment.